Plate Tectonics is a widely-accepted model used to explain the behavior of the Earth's outermost rocky layer, the crust, which exists as a number of puzzle-piece-like plates that are about 80 kilometers thick. It is a relatively new scientific concept having only emerged and matured as a widely accepted theory since the 1960s. In a nutshell, this theory states that the Earth’s outermost layer is fragmented into a dozen or more large and small solid slabs, called lithospheric plates or tectonic plates, that are moving relative to one another as they ride atop hotter, more mobile mantle material (called the asthenosphere). The average rates of motion of these restless plates—in the past as well as the present—range from less than 1 to more than 15 centimeters per year. With some notable exceptions. Most of the geological activity - mountain building, rift valleys, volcanoes, earthquakes, faulting - is due to different types of interaction at plate boundaries. Plate tectonics is now the mechanism used to support the long-standing view of continental drift, which purports the migration of continents to their present location following the breakup of a single landmass known as Pangea. World map of plate tectonic activity. The world's earthquakes and volcanoes are not randomly distributed over the Earth's surface. They tend to be concentrated in narrow zones called hot spots. The theory of plate tectonics tells us that the Earth's rigid outer shell (lithosphere) is broken into a mosaic of oceanic and continental plates which can slide over the plastic asthenosphere, which is the uppermost layer of the mantle. The plates are in constant motion. Where they interact, along their margins, important geological processes take place, such as the formation of mountain belts, earthquakes, and volcanoes. The lithosphere covers the whole Earth. Therefore, ocean plates are also involved, more particularly in the process of seafloor spreading. This involves the midocean ridges which are a system of narrow submarine cracks that can be traced down the center of the major oceans. The ocean floor is being continuously pulled apart along these mid ocean ridges. Hot volcanic material rises from the Earth's mantle to fill the gap and continuously forms new oceanic crust. The midocean ridges themselves are broken by offsets know as transform faults. To learn more about how plate tectonics work, start at the diagram (available as a pdf) and explanation labeled. Although this diagram shows the interaction between continental and oceanic plates, the processes illustrated generally apply for the interaction between two oceanic plates. 1.There are two basic types of LITHOSPHERE: continental and oceanic. CONTINENTAL lithosphere has a low density because it is made of relatively light-weight minerals. OCEANIC lithosphere is denser than continental lithosphere because it is composed of heavier minerals. 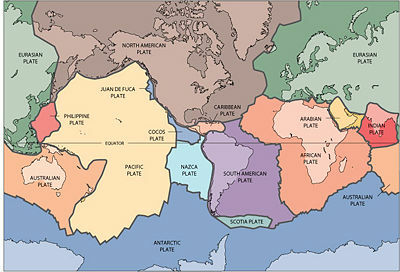 A plate may be made up entirely of oceanic or continental lithosphere, but most are partly oceanic and partly continental. 2.Beneath the lithospheric plates lies the ASTHENOSPHERE, a layer of the mantle composed of denser semi-solid rock. Because the plates are less dense than the asthenosphere beneath them, they are floating on top of the asthenosphere. 3.Deep within the asthenosphere the pressure and temperature are so high that the rock can soften and partly melt. The softened but dense rock can flow very slowly (think of Silly Putty) over geologic time. Where temperature instabilities exist near the core/mantle boundary, slowly moving convection currents may form within the semi-solid asthenosphere. 4.Once formed, convection currents bring hot material from deeper within the mantle up toward the surface. 5.As they rise and approach the surface, convection currents diverge at the base of the lithosphere. The diverging currents exert a weak tension or “pull” on the solid plate above it. Tension and high heat flow weakens the floating, solid plate, causing it to break apart. The two sides of the now-split plate then move away from each other, forming a DIVERGENT PLATE BOUNDARY. 6.The space between these diverging plates is filled with molten rocks (magma) from below. Contact with seawater cools the magma, which quickly solidifies, forming new oceanic lithosphere. This continuous process, operating over millions of years, builds a chain of submarine volcanoes and rift valleys called a MID-OCEAN RIDGE or an OCEANIC SPREADING RIDGE. 7.As new molten rock continues to be extruded at the mid-ocean ridge and added to the oceanic plate (6), the older (earlier formed) part of the plate moves away from the ridge where it was originally created. 8.As the oceanic plate moves farther and farther away from the active, hot spreading ridge, it gradually cools down. The colder the plate gets, the denser (“heavier”) it becomes. Eventually, the edge of the plate that is farthest from the spreading ridges cools so much that it becomes denser than the asthenosphere beneath it. 9.As you know, denser materials sink, and that’s exactly what happens to the oceanic plate—it starts to sink into the asthenosphere! Where one plate sinks beneath another a subduction zone forms. 10.The sinking lead edge of the oceanic plate actually “pulls” the rest of the plate behind it—evidence suggests this is the main driving force of subduction. Geologists are not sure how deep the oceanic plate sinks before it begins to melt and lose its identity as a rigid slab, but we do know that it remains solid far beyond depths of 100 km beneath the Earth’s surface. 11.Subduction zones are one type of CONVERGENT PLATE BOUNDARY, the type of plate boundary that forms where two plates are moving toward one another. Notice that although the cool oceanic plate is sinking, the cool but less dense continental plate floats like a cork on top of the denser asthenosphere. 12.When the subducting oceanic plate sinks deep below the Earth’s surface, the great temperature and pressure at depth cause the fluids to “sweat” from the sinking plate. The fluids sweated out percolate upward, helping to locally melt the overlying solid mantle above the subducting plate to form pockets of liquid rock (magma). 13.The newly generated molten mantle (magma) is less dense than the surrounding rock, so it rises toward the surface. Most of the magma cools and solidifies as large bodies of plutonic (intrusive) rocks far below the Earth’s surface. These large bodies, when later exposed by erosion, commonly form cores of many great mountain ranges [such as the Sierra Nevada (California) or the Andes (South America)] that are created along the subduction zones where the plates converge. 14.Some of the molten rock may reach the Earth’s surface to erupt as the pent-up gas pressure in the magma is suddenly released, forming volcanic (extrusive) rocks. Over time, lava and ash erupted each time magma reaches the surface will accumulate—layer upon layer—to construct volcanic mountain ranges and plateaus, such as the Cascade Range and the Columbia River Plateau (Pacific Northwest, U.S.A.). The continental drift is an ancient forerunner to the theory of plate tectonics, which suggests that continents have migrated to their present location following the breakup of a single landmass known as Pangaea (meaning "all lands" in Greek). 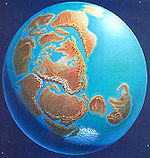 The diagrams at right illustrates the break-up of this supercontinent, the existence of which figured prominently in the theory of continental drift. The theory was developed primarily due to the similarity in shape of continental shorelines, such as that of South America and Africa, which causes them to appear as though they were once joined together. Similar rock formations and organisms can also be found on coasts that are thought to have once been adjoined. The concept of plate tectonics has revolutionized thinking in the Earth sciences in the last 10 years and combines many of the ideas about continental drift and sea-floor spreading. 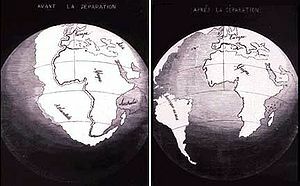 The theory of continental drift was put forth by a creation scientist named Antonio Snider-Pellegrini, who published the concept in his book, La Création et ses mystères dévoilés (Creation and its Mysteries Unveiled), in 1858. In 1912 by Alfred Wegener furthered developed the theory of continental drift (Kontinentalverschiebung), and sea-floor spreading was suggested originally by Harry Hess of Princeton University. To form his theory, Snider drew from Genesis 1:9-10 where it is explained that God gathered the seas into one place, suggesting the possibility of one single landmass at that point in time. He also observed the close fit of the Eastern South American coast and the Western African coast. He concluded that the Flood of Noah had caused subsequent horizontal movement of the supercontinent causing it to break, thus forming the tectonic plates. Snider's idea was overlooked, possibly due to the fact that Darwin's book had been published in the same year. Snider wrote a book and even had it translated into French, but still, his theory went unnoticed until the early twentieth century. At that time, the German meteorologist Alfred Wegener wrote a book on the idea of one original supercontinent called Pangaea. But still, for about 50 years this thought was neglected due to a small group of seismologists who professed that the strength of the mantle rock was too great to allow continents to drift in the way Wegener had calculated. They estimated the rocks strength by watching the behavior of seismic waves as they went through the earth. But they were calculating the strength of the rocks at the time of their testing, not from back when the earth was in it's pre-flood state. During those 50 years, scientists who believed in the theory of one original supercontinent were considered ignorant people who didn't look at the facts. But today, that view has reversed. Catastrophic plate tectonics is a theory that proposes rapid movement of the Earth's plates during the flood of Noah. It was originally derived by Dr. John Baumgardner, and substantiated by sophisticated computer modeling. Many creation geologists feel it fits with standard geology better than other flood models because it offers a scientific description of the flood of Noah that is compatible with plate tectonics and continental drift theories. It also provides a mechanism for the source and recession of the flood water (i.e. the fountains of the great deep), and accepts the conventional interpretation of events like earthquakes and volcanic activity. Because it simply requires an accelerated timescale for plate movement, the conflict with traditional uniformitarian geology is also minimal. Baumgardner's model is illustrated in the 27 minute documentary titled: In the Beginning: Catastrophic Plate Tectonics and the Genesis Flood, which was produced by Keziah and may be previewed online. Precise documentation that the world's earthquake and volcanic activity is concentrated along oceanic trenches and submarine mountain ranges. In the 1950s, oceanic exploration greatly expanded. Data gathered by oceanographic surveys conducted by many nations led to the discovery that a great mountain range on the ocean floor virtually encircled the Earth. Called the global mid-ocean ridge, this immense submarine mountain chain -- more than 50,000 kilometers (km) long and, in places, more than 800 km across -- zig-zags between the continents, winding its way around the globe like the seam on a baseball. Rising an average of about 4,500 meters(m) above the seafloor, the mid-ocean ridge overshadows all the mountains in the United States except for Mount McKinley (Denali) in Alaska (6,194 m). Though hidden beneath the ocean surface, the global mid-ocean ridge system is the most prominent topographic feature on the surface of our planet. The continental drift theory draws strong support from paleomagnetic readings of the ocean flood that have revealed a striped pattern of field reversals indicating that the flood has spread outward from the mid-oceanic ridge. The movement of continental plates can also explain the existence of earthquakes and the so-called Ring of Fire around the Pacific. In 1947, seismologists on the U.S. research ship Atlantis found that the sediment layer on the floor of the Atlantic was much thinner than originally thought. Scientists had previously believed that the oceans have existed for at least 4 billion years, so therefore the sediment layer should have been very thick. Why then was there so little accumulation of sedimentary rock and debris on the ocean floor? While the simplest and most obvious explanation for minimal seafloor sediment is that the earth is young, geologists hold fast to philosophical naturalism and the belief that the Earth is billions of years old. Model of recycling oceanic crust. Uniformitarian geologists believe that red-hot magma is constantly squeezed up from the mantle through rifts in the ocean floor. As new magma is squeezed in, the older crust is moved out from the mid ocean ridge like a conveyor belt. When adjacent plates collide due to this outward movement, some plates are forced downward under others causing the sedimentary rock to be "recycled". ↑ 1.0 1.1 1.2 Plate Tectonics in a Nutshell by the U.S. Geological Survey, Accessed November 17, 2010. ↑ 2.0 2.1 2.2 2.3 2.4 Earthquakes and Plate Tectonics by the U.S. Geological Survey, Earthquake Hazards Program. ↑ Rift in the Ocean Floor by the U.S. Geological Survey, Earthquake Hazards Program. This page was last modified on 21 July 2018, at 12:18.